The combo board for teachers who want more cork! Many of the combo boards that we offer possess more markerboard space than space to hang notices and announcements on resilient cork. The Dry Erase Combo Board is for the teachers who want more cork for displaying important schedule changes and school policy initiatives. Creative teachers love the thinner strip of bounce back cork that runs along the top of this combo board. The thinner cork strip allows teachers to post daily inspirational messages. While the Dry Eras Combo Board markerboard is smaller than any of our combo markerboards, the three foot by six foot writing space is more than enough room to present multiple scholastic lessons at the same time. 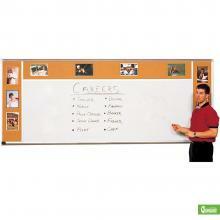 Moreover, this board retains the same rugged construction as our markerboards. The porcelain steel construction prevents the nicks and scratches that damage other types of markerboards, thus ensuring you have a long lasting way to instruct your students.